Spins head and ears around and slightly hops about. Players earn Pristine Gizmos by completing the account-wide weekly quest, Pet Battle Challenge: Gnomeregan. Prerequisites for the Gnomeregan Challenge quest include: Gnomeregan's New Guardians (Normal) and at least 15 max level battle pets. Overtunes the user's central power core, dealing 197 Mechanical damage and increasing the user's speed by 100% for 2 rounds. Lays down a field of mines behind the opponent. 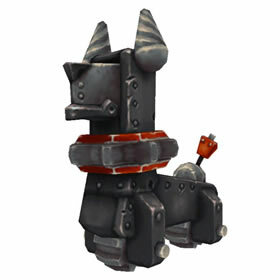 The next pet to swap into the battle will receive 788 Mechanical damage. I was hoping that this guy would have the Warning! ability. Only three pets have it to date (the old Alarm-o-Bot and the other 2 new Gnomeregan pets). He does have the Alert! ability which only 2 pets have (him and the Alarm-o-Bot), but it's not so special. In my opinion Alert! should either shatter armor for 1 round or "always go first", otherwise it's just a mundane attack. I will have to say I love the way he looks, but as far as battles go, he's a H/H basic mechanical "good vs beast" pet. The Alarm-O-Dog was built for security purposes, but people really wanted one for their home because they are so darn cute.